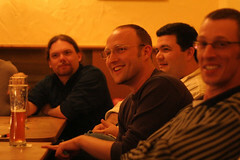 Here's a pic from Pre Podcastday 2006 (i.e. getting drinks the night before). You wouldn't know it but those are big name podcasters sitting around me. I guess that's the perks of podcasting vs. vlogging, you don't show you face as much and are more anonymous. :-) Thanks for the shot chouchpotatoes!! !